More and more diseases are becoming resistant to antibiotics. Within a few decades, we’ll enter the “post-antibiotic era,” a time when even the most routine infections could threaten our lives. 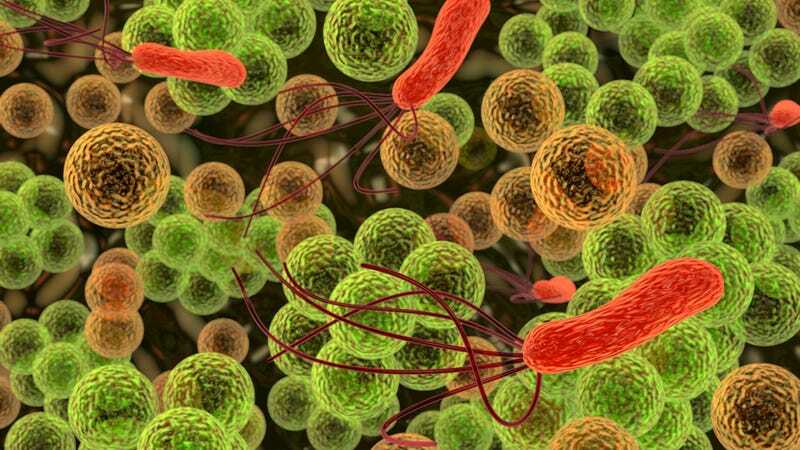 It’s a frightening prospect — but we may have some novel bacteria-fighting tricks up our sleeve. Antibiotics, also known as antimicrobials, have been called a “miracle cure” — and for good reason. When these bacteria-fighting drugs were first introduced to the public in the 1940s they became an instant game-changer. Widespread infections could suddenly be treated with astounding efficacy, warding off blights like syphilis, gonorrhoea, leprosy, and tuberculosis. This medical revolution resulted in an increase in overall human lifespan. The first antibiotic, penicillin, was developed by the Scottish biologist Alexander Fleming in 1928. As a term, “antibiotics” was originally used to describe any natural compound produced by a microorganism or fungus that could kill disease-causing bacteria in humans and animals. These days, antibiotics can describe any compound, including synthetics, that can either destroy or prevent the growth of dangerous microbes. The problem, however, has been the dramatic rise of antibiotic resistant (AR) strains of bacteria. As anyone with even the most rudimentary understanding of Darwinian processes knows, the use of antibiotics results in a selectional process whereby hardy and drug-resistant microbes survive and breed; they’re simply adapting. Now, some 70 years after their advent, antibiotics are starting to fail with disturbing regularity. Image: Clusters of MRSA bacteria as seen through a scanning electron micrograph. Credit: Annie Cavanagh. In addition, there are now AR strains of E. coli, tuberculosis, and gonorrhoea (against which there is only one antibiotic left that works). NDM-1, another dangerous strain to consider, is resistant to one of the more powerful groups of drugs, carbapenem antibiotics, and it has been detected in U.K. patients. Two years ago, 25,000 Europeans died of bacterial infections that were resistant to antibiotics. Reacting to this trend, the World Health Organization has warned that “the world is on the brink of losing these miracle cures.” Looking to the near future, the organization worries that many common infections will cease to have a cure and, “once again, kill unabated.” It notes that the rate at which antibiotic drugs are being supplanted by AR bacteria lags behind the development of replacement drugs. And it’s not just about hospital “superbugs” — this is an issue that pertains to even the most common microbes. While evolutionary processes have certainly contributed to the rise of AR strains, so too have poor medical practices, a deep-rooted sense of denial, and just plain negligence. “Irrational and inappropriate use of antimicrobials is by far the biggest driver of drug resistance,” claims the WHO. “This includes overuse, when drugs are dispensed too liberally, sometimes to ‘be on the safe side’, sometimes in response to patient demand, but often for doctors and pharmacists to make more money.” Doctors are also guilty of of underdosing, a practice which allows resistant bacteria to survive. A recent report in the British Medical Journal by Richard Smith and Joanna Coast points out that the existing class of antibiotics may be the best we will ever have. There have been efforts to support interventions that encourage more conservative and appropriate use of antibiotics to halt or slow down the progress of AR bacteria, but the report’s authors say it’s too little, too late. Smith and Coast contend that AR has fallen victim to evidence-based policy making, which “prioritizes health problems according to economic burden” and the “cost effectiveness of each intervention.” As a result, health economists have been unable to show that antibiotic resistance costs enough money to be a health priority. But this ignorance may be changing. One study has shown that antibiotic-resistant infections cost the U.S. healthcare system in excess of $20 billion annually. It also results in more than $35 billion in societal costs and more than eight million additional days spent at the hospital. There’s also the use of antibiotics in livestock to consider. These drugs are not used to heal animals, but rather to make them grow faster and suppress diseases. In many parts of the world, more than 50% in tonnage of all antimicrobial production is used in food-producing animals. Two years ago, 30 million pounds of antibiotics were used for livestock — that’s 80% of all sales. And it’s a number that’s still growing. According to David Kessler, commissioner of the Food and Drug Administration from 1990 to 1997, the FDA monitors antibiotics used to treat livestock animals — but they know virtually nothing about them. This means we only a vague idea of how 80% of our antibiotics are being used. ...Combating resistance requires monitoring both the prevalence of antibiotic-resistant bacteria in our food, as well as the use of antibiotics on livestock. In human medicine, hospitals increasingly track resistance rates and antibiotic prescription rates to understand how the use of these drugs affects resistance. We need to cover both sides of this equation in agriculture, too. Despite the doom-and-gloom, there are still things we can do, both in terms of policy changes and in the development of new therapeutic techniques. Governments can do their part by incentivizing and encouraging health workers, pharmacists, civil society, patients, and industry to do their part. Surveillance efforts can be expanded (including better oversight of livestock), along with improved use of medicines for humans and animals. Drug regulations and supply systems can be improved. We should also work to prevent and control infections to the best of our abilities (like improved hygiene practices). And of course, we should also encourage the development of new medical countermeasures, such as new antibiotics, bacteria-fighting viruses, and vaccines. Of these, the idea of producing more antibiotics is the least attractive. They’re prohibitively expensive to develop, and there are no more easy targets. But the other two lines of inquiry are already showing promise. Viruses, in particular, have long been touted as a solution to antibiotic resistance. Back in 1915, a group of viruses which infect and kill bacteria — called bacteriophages — were discovered. These phages were found in the former Soviet republic of Georgia and are still part of the medical practices there. Now, as a brand new study published in PLOS has shown, a phage-encoded molecule can be used to kill a wide range of bacteria, including MRSA. The new drug, called Epimerox, targets weaknesses in bacteria that have been traditionally exploited by viruses. The drug can protect animals from fatal infection by Bacillus anthracis, the bacteria that causes anthrax. And remarkably, Epimerox has shown a tremendous capacity for resistance in developing resistant bacteria. "We're taking advantage of what phage have 'learned' during this period for us to identify new antibiotic targets that we believe will escape the problem of resistance found for other antibiotics," said lead researcher Vincent A. Fischetti, a professor and head of the Laboratory of Bacterial Pathogenesis and Immunology. There’s also the potential for vaccines. Several years ago, U.K. chief medical officer Liam Donaldson predicted that vaccines for for MRSA and C. difficile should be ready within a decade. Indeed, work on vaccines has begun. Immunologist Robert Daum has devised an unorthodox strategy in which T cells are stimulated — a part of the immune system that’s not typically considered. The idea is to base a vaccine on stimulating Th-17 lymphocytes and production of interleukin-17. They’re still several years away from even a Phase I formula, but it could herald the first generation of anti-bacterial vaccines. Whether or not this is the right approach still needs to be seen. But it’s certainly the right attitude. Yes, the post-antibiotic era is nearly upon us, but as always, we’ll continue to fight and find new ways to combat the most efficient and prolific organism this planet has ever seen. Images: Top: Knorre/Shutterstock; CBS News (turkeys); ktsdesign/Shutterstock (bacteriophage).